While much has been written about the Allied invasion on D-Day, very little had been known from the German side of this historical event, particularly the German 352nd Infantry Division (352ID), responsible for the defense of Omaha Beach. Shortly after the end of World War II, while a prisoner of war in the United States, Lt Col. Fritz Ziegalmann (Chief of Staff of the 352ID) wrote a history of the 352nd Infantry Division in Normandy. While most scholar draw upon the US Army's 1948 translation of Ziegalmann's work, their document lacked suitable translations for German military terminology and expressions. After a five year search, I found Ziegalman's original works and made my own translation to English to gain a more accurate understanding of the content and to draw a clearer understanding of the German preparations and defense of the Omaha Beach Sector. Building on Ziegalmann's narratives, I assembled, edited and expanded his narrative with additional materials and comments which I hope will provide the reader with new insights and a more complete understanding of the history of Omaha Beach. Below are excepts from this work. “352ID is to be activated by the 7th Army Command in Normandy, to be formed around cadres of the 321ID in Army group Middle (Russia) which by October 1943 had been decimated as a result of the Soviet counter offenses following Operation Zitadelle. It is to be draw replacements from 'Wehrkreiss XI (11th Defense District)." “As for the eventual date of deployment after completing the formation of the 352ID (to the Eastern Front, Italian Front, the Balkans or remain in the West? ), there were no clear orders. It was generally assumed that we could count on being sent to the Eastern Front after the 1st of March1944. So training for the 352ID focused on Eastern Front combat operations. The building process itself went very slowly, especially procurement. Since I had been, from October 1942 to March 1943, Chief Quartermaster for the Army High Command and at this time intimate with procurement issues; it fell to me to providing equipment to outfit the now forming 352ID. For example, live-fire training school was not possible until the end of February, because the delivery of gun sights and sight mounting-plates was not possible before mid-February. By March, each soldier had thrown just two hand-grenades and had only three live-fire training exercises. The training of auxiliary drivers (French civilian truck drivers) was not possible until the 1st of May, because of fuel shortages. During training, we also had our manpower problems. Our 14 infantry companies were not set up until February, and then they were trained for the Russian Front as anti-tank companies. The replacements, mostly teenagers, were physically unfit for all but limited military duty, because of food shortages in Germany. As of May 1st, 50% of the officer corps was inexperienced and 30% of the noncommissioned officer positions went unfilled, because of the lack of competent sergeants. The total manpower of our ‘Type 44' infantry division amounted to around 12,000 men of which 6,800 were combat troops, including around 1,500 ‘Hiwis’ (Russian Volunteers). By the fall of 1944, after five years of war, Germany had exhausted its manpower base while still being pressed to provide fresh Divisions to the war-fronts. The ‘Old’ German Division model included three infantry regiments (3,250 men each) having three battalions in each regiment; with a Division manpower total of 17,200 men. During this initial organizing period, the Division was ordered to have ready, by January 1st., a special combat team, on 'stand-by' for possible emergency deployment in Holland, Belgium and France. This team consisted of a infantry regiment, an artillery and an engineer battalion with elements of signal, supply and divisional staffs. The mobilization and deployment of this force was possible, by foot and rail, with 12 hours notice. From the 1st of May 1944, the same readiness measures were applied to the entire Division. By the 1st of March 1944, the 352ID reached adequate strength and was fully equipped. But, because of diversions of men and material to the Russian Front, the slow arrival of new men, ammunition and weapons during the previous three months, delayed proper training until now. Company and battery level training was probably satisfactory, if not judged too harshly, however battalion and regiment level training did not take place. Our monthly reports on these training deficiencies were ignored by the OKW. My impression was that they were only interested in delivering 'patched-up divisions' as soon as possible, leaving training problems entirely to a division's command to solve. This mistake often led to the destruction of divisions during their first days of combat. “The lengthy La Harve-to-Vire River Coastal Defensive Zone, which included Omaha, Gold. Juno and Sword Beaches, was guarded only by the 716th Infantry Division (716ID). This Division was classified as a ' Static Division,' which means it was not equipped, trained nor manned for maneuver and offensive capabilities required of a normal infantry division. Consequently, resources were not provided to equipped or train for modern maneuver-warfare. They were armed with captured weapons from Poland, France and Czechoslovakia which compounded the munitions supply logistics. Under the High Command of the west (OKW), relying on divisions on rest and refitting leave in France did not provide the fixed long term uninterrupted oversight needed to construct a comprehensive coastal defense. “To address his dissatisfied with the efforts of OKW in preparing the 'Atlantic Wall,' in November 1943 Hitler appointed Field Marshal Erin Rommel as Inspector-General of the preparations of the coastal defenses in the west, reporting directly to Hitler himself and by-passing OKW. “In early March the 352.ID was ordered to deploy our 1352nd Artillery Regiment (Artillerieregiment 1352 ) to bolster the existing defenses in front of Bayeux and to the west. Though the 1352nd Artillery Regiment (abv. AR.1352) now served tactically under the command of the 716ID (716th Infantry Division), its training was still managed by the 352ID. General Rommel (center) on his inspection tour of the beach defenses in the 84th Army Corps Zone. General Marcks is seen standing to the left. "On the left, the 352ID took over the 53km long 'Bayeux Zone,' taking over and keeping in place the 716ID's 726th Infantry Regiment (Grenadierregiment 726, abv. GR726) there." The Bayeux Zone was broken into three command sectors, with the GR.726 command keeping contol of the east sector. As a trade-off for GR.losing some battalions to other sector commands, the 352ID would have to give up to the GR.726 command, the 1st Battalion of its' 916th Infantry Regiment (I/GR.916) which was then placed just east of Arromanches on the border of the 716ID's Zone. The German terms 'Abteilung' and 'Battalion' tend to be used interchangeably by modern scholars But 'Abteilung' differ from Battalions. Battalion (abv. Btl) is an 'Section' organic to a regimental command. Abteilung (abv. Abt) is a battalion size 'detachment' capable of operating independently, or conventionally deployed under a regimental command. They can be deployed and operated effectively under various assigned commands without Division level supervision. 1. First, to defend the Bayeux Coastal Zone. 2. Second, make improvements in the combat area. 3. And third, train combat units for battle. These duties were quite agreeable to an untested Division that thought it would end up on the Eastern Front were it is not so easy. As to our preparations for the Defense of the Bayeux Coastal Zone, we assumed control of 716ID’s existing ‘Reinforced’ GR726 forces in the Bayreux sector, excluding its 2nd Battalion (II/GR.726). The staffs of the 352ID's 914th and 915th Regiments (GR.914, and GR.915) took command of the 'left' and the 'center' Battalion (now Regimental) Sectors respectively. The right Sector remained under control of the GR726 HQ staff which now reported to the 352ID's command, not it's parent Division 716ID. GR.726 's beach front battalions (III/GR.726 and I/GR.726) in the new Left (GR.914) and Center (GR.916) Regimental Command Sectors, were kept in their existing positions but now came under the appropriate 352ID Regimental command. Originally, the GR916 (Col. Ernst Goth) itself, along with the 352nd Rifle Battalion, (Fuesilierabteilung 352, abv. FusAbt.352) was assigned under the direct command of Gen. Marcks, Commanding General of the 84th Army Corps. But on May 20th , the 915th Regiment (GR.915) exchanged roles with GR916 and, along with the 352nd Rifle Battalion. GR915 was now the new 84th Army Corps’ Reserves. “The plan for our preparations resulted from this exacting terrain study, influenced by the previous Allied landings in Sicily and Italy as well as General Marcks’ detailed map war game exercises and conferences. On the basis of these detailed, persuasive discussions and table-top war game exercises conducted by Gen. Marcks, I too agreed with his opinion that the Invasion, at least a part of the invasion, would be targeted against the Cotentin peninsula; from which a breakout to the east and south would follow with the ultimate goal then to thrust at the chief communications hub of Paris. Major General Marcks, Commander of the 84th Army Corps, including the 352ID, lost a leg in the invasion of Russian earlier and was killed June 12th in the St Lo area as his artificial leg slowed his escape from a staff car being attacked by fighter aircraft. After a study of the analyses of the landings on Sicily and in Italy proper, it was clear to me, that as soon as possible upon landing, the enemy would attempt to capture ideal harbors such as the large harbor of Cherbourg and the harbors near Caen and St. Malo. Afterwards they would develop larger bridgeheads with the necessary elements (build-up of reserves and breakout) that assured continued success of the Invasion. Consequently the large harbor of Cherbourg, because of its favorable short distances to the south coast of England, had the greatest importance. 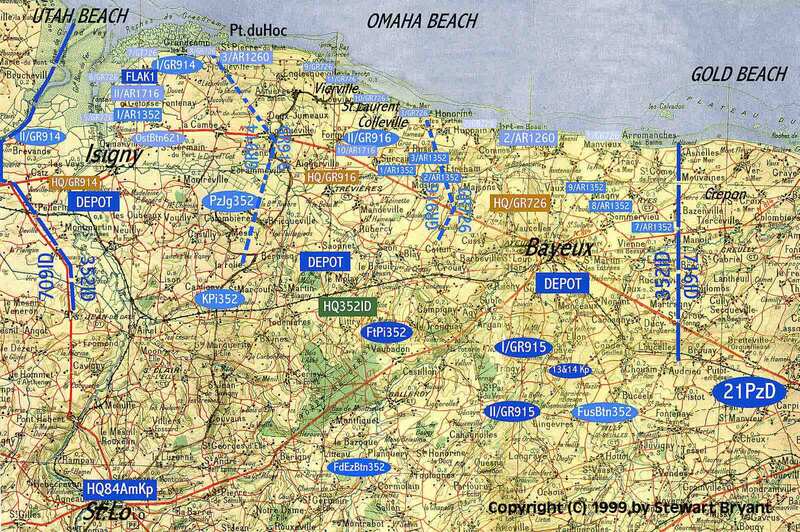 At these conferences General Marcks developed a scenario were the Allies would aim at taking Cherburg harbor by first cutting off the Carentan Peninsula through a massive airborne landings at the base of the peninsula along the Lessay to Carentan line. So, the deployment of our forces was guided by the high probability that the enemy will seek the spacious Cherbourg harbor, by first cutting off the Cotentan peninsula. After strengthening his bridgehead with additional forces, he would then break-out to the south and south-east (through the 352ID's left wing) and push on to Paris. Therefore the focus in the 352ID’s sector was to both reinforce the left wing from the mouth of the river Vire to the south-east of the Cotentin peninsula with GR.914 and to use the 2nd Battalion from GR.916 (II/GR.916) as a Division reserve to strengthen the areas around St. Laurent (Omaha Beach) and send its 1st Battalion (I/GR.916) to Arromanches (what would become the Gold Beach area). These areas had beaches most likely threatened by enemy landings by sea. The 84th Army Corps Reserve (Reinforced GR.915) was kept in readiness on the Division's right-wing, south of Bayeux, to deal with a possible withdrawal of the 21st Panzer Division, situated as counter-attack reserves just to the east. There was some concern by Gen. Marcks that the 21st Panzer Division would be pulled out by the High Command leaving the right wing leaving him without reserve forces to back up the 716ID Zone. The 84th Army Corps (AKLXXXIV) had no forces of its own which was the normal custom, to be available as reserves. The lack of Corps reserve manpower-strapped 84th Army Corps and forced Gen. Marks to appropriate 352ID battalions. This not only reduced 352ID ability to perform its own mission (defense of the 352ID Zone) but assignment of battalions out side their home regiment, affected their ability to coordinate operations with their new regimental commands. “Eventually It became clear to us that the invasion was liable to happen by summer and directly involve our zone. This was supported by press reports about Russia's call for decisive intervention by the Western Powers, by a new stricter censorship in England and the curbing of diplomatic privileges, by the presence (according to the Army newspaper Wehrmacht) of enemy landing crafts gathering on the south coast of England and by the cancellation, from March-on, of all furloughs for every commanding and general staff officers. The way the High Command (OKW) carefully monitored the tides also suggested that they expected an invasion soon. 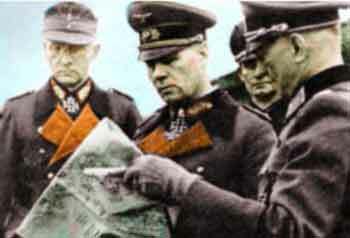 "The employment of reserves was Fieldmarshal Rommel's specialty. He believed with all heavy weapons (the Division's field strength) incorporated into existing beach strong-points or added to new fortifications, the enemy could be destroyed in the water in front of our 'Main Line of Resistance' (MLR). Lt. Gen Dietrich Kraiss, Commander of the 352nd Infantry Division. He was killed during the final bombings of St. Lo which also shattered the 352nd. On Rommel's visit in May, I was reproached for not bringing reserves (rifle companies without heavy weapons) up close to the coast. In response, I questioned Rommel on how enemy infiltration in the rear of our zone could be countered with-out reserves well behind the lines. This question remained unanswered. I clearly felt that with an attack on our beach positions the whole area would be under heavy naval fire and air attacks, making any counter-attack by assault-reserves impossible during the daylight. He did not respond but he did feel that every soldier had to be able to concentrate his fire on the water's edge. Gen, Kraiss, my Division’s chief, agreed with me but he also felt we must find a compromise solution. Therefore, some reserves (rifle companies) were ordered nearer to the ‘MLR’ (Main-Line-of- Resistance, the line of beach-front ‘Resistance Nest’), so that they could fire directly onto the shore. Yet a counterattack would still be possible by having the remaining reserve held back in depth. Though tactical reserves were moved up strategic reserves, including relocation of supply depots closer to front, where held back. Anyway, it was necessary to conduct an exact terrain reconnaissance and do more emplacement work. To deal with the threat of a cross channel operation, Germany lacked a maritime-operations doctrine. So they drew upon two land-operations doctrine to define their strategy. The First held that widely separated forward strong-points (a false MLR) would screen a main mobile force hidden in reserve (real MLR) ready to counter-attack the enemy's newly exposed flacks as the enemy turn to envelope these forward post. A successful tactic on the eastern front. The Second, was the River-Crossing doctrine, where all forces are massed on the river bank to annihilate a crossing before a bridgehead is established. Rommel felt the second doctrine best fit the channel crossing scenario. This is because, once established, a bridgehead can not be out-flanked and could hold off attacks up to five times their strength during its 'build-up' phase. This would allow a build up of Allied forces and eventual breakout with overwhelming force. The types of combat positions organized within the Division's sector were Widerstandsnester (Resistance Nest) manned by one or two squads of roughly 20 men, Stutzpunkt (Strong-points), a grouping of several mutually supporting Resistance Nest manned by a platoon to company, and Verteidigungsbereich (Defense Complex) manned by one to two companies. Hitler gave orders to “hold each position to the last man and last bullet.” Abandoning a defense position during battle was now impossible. For instance, could a strong-point crew leave their fortification to help a neighbor? “Would an artillery battery under bombardment be allowed to take up a new firing position? The High Command (OKW) could not resolve this issue. But a novel solution was provided by Rommel declaring the whole military region, including the Division's zone, as a single Festung Kreis (a military base) with a sea-front facing the beach and a parallel l0-15 km deep land-front facing south to the rear. The entire Division along with supply troops could to be stationed in this 100km long ‘Position.’ Besides dealing with logistics, the supply troops would defend the land-front against enemy airborne troops. As it turned out though, this did not work because the army supply depots were too far to the south, out side the designated 'Fortress Area.' Considering that the 352ID (except for the fixed facilities) had only one-issue of ammunition, because of their 'special' (construction and training) duties, both rear defense and logistic support by supply troops could only be described as insufficient throughout the ensuing campaign. To capture bailed-out enemy air crews and deal with any local unrest, ‘search patrols’ on bicycles or motorcycles were organized within each regimental sector. Through their efforts, a small number of air crews would be delivered to the Air Force interrogation services in Caen. Before March 20th 1944, improvements in the Bayeux Coastal Defense Zone was considered 'below average.' But with the arrival of Fieldmarshal Rommel, activity picked up in our zone, providing work to many 'local administration offices.' Despite hasty orders and a lack of experience and material during this period, improvements were actually made which later made the invasion more difficult. Assuming these landings would only take place at high tide, obstacles of all kind were erected on the tidal plate of the beach so that their upper parts projected just above the water surface at high tide. 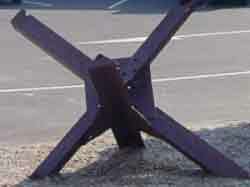 Pile driven stakes of metal and concrete as well as wooden trestles, and steel anti-tank obstacles called “Tschechen” (“Czechs”) were installed; some armed with under-water or surface mines and high explosives. They were iron anti-tank obstacles set up on the Czechoslovakian-German border before the war. After awhile the work had to be done over. These obstacles silted up and had to be dug out of the sand. And during the storms in April, most of these obstacles were torn out and the mines detonated. Even though cutting new logs in the Cerisy Forest was allowed only after permission had been secured, they had to be transported at least 30km by horse-drawn vehicles because of fuel shortages. And since they had to be logged by hard-to-get circular saws and rammed in position by hand, it took a considerable time, particularly on the rocky shore at Grandcamp. Yet our results were surprisingly good. In the second half of May, the possibility of a landings at low tide was discussed. So work on additional obstacles out beyond the tidal flats was begun but it was impossible to plant these obstacles at a proper depth. We also assumed properly equipped enemy commandos could scale the steep cliffs around St. Pierre du Mont (area of Pointe du Hoc) and at Longues. Here, the Engineer Battalion (Pionierabtielung) prepared old 24cm shells, with an effective shrapnel range of 600m, to roll down on the beach and explode when triggered by a trip wire. By June 1st, we had placed one of these shells every 100m on the cliffs. In his refernce to 'Combat Engineers' above, it is safe to assume that Ziegalmann referred to the 352nd Combat Engineers (Pionerabtielung 352, abv. PiAbt.352). A final innovation was the employment of 'Goliat' (Goliath), a small remote controlled tank packed with explosives, but these weapons arrived on June 5th and were not used. It became evident that Rommel's authority was not enough to complete the construction of concrete fortifications. The availability of cement and dealing with four independent construction authorities were decisive issues. Air force workers, Navy, Organization Todt (the prime construction contractor), personnel and our own 'Fortress Engineers' worked side by side, often duplicating the work. Once again over-organization proved to be a menace. Almost half of the battle installations were out-moded and, at most, poorly reinforcement. In the Division's sector alone, analysis showed that only 15% of the cement fortifications were bomb-resistant, 45% were shrapnel-proof. Uneven distribution of building material was the order of the day. In our sector the Air Force built concrete positions while our infantry with their heavy weapons were in poor earth emplacements prone to flooding. On June 6th , the Air Force's concrete shelters were never used, while with earth emplacements it was impossible for our soldiers to defend them for long.